It’s that time of the week again…Wrap Wednesday! Today I wanted to share a twist that I put to fajitas that I made last night. Instead of having to make a bunch of tortillas with all the filling, I thought it would be nice to fit all the ingredients into a single wrap. When Erin and I were at Expo West, we were across from Frontera Gourmet Mexican Products and I soon became obsessed with all their whole line. From the salsa, queso dip, chips, and marinades, I had so many options for a Mexican themed dinner! I have become completely obsessed with their marinades and decided to use the chipotle lime fajita sauce to whip up chicken fajita wraps for dinner last night. My boyfriend was beyond thrilled to be my taste tester and gave these wraps two thumbs up! Heat 1 tablespoon coconut oil in a medium pan. Add onion and peppers. Cook until crisp-tender, stirring occasionally. Remove and set aside. Next, add 1 tablespoon coconut oil into the same pan and add in chicken. Cook until golden. Stir in vegetables and fajita sauce. Mix all ingredients thoroughly together until heated. Take mixture off heat and warm wraps in the microwave for about 15 seconds. 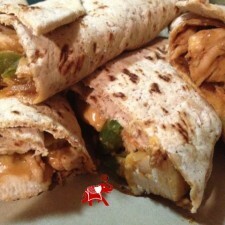 Place fajita mixture in the middle of the wrap, sprinkle with cheese and other desired toppings. Fold, cut in half, and enjoy! I personally loved taking the concept of chicken fajitas and turning them into one wrap because the total carb count on this meal stays low. When I eat regular fajitas, I tend to have at least 2 to 4 tortillas. Depending on how hungry I am, that can quickly add up! I also always stick to fat-free cheese to keep the total fat content lower as well. Feel free to add your favorite fajita toppings into this wrap, such as lettuce, tomato, and sour cream. If you’re really looking to make this meal tasty and indulge a little…chips and salsa would go great also! Do you have a favorite wrap recipe you like to make? I’ve only heard about the benefits of coconut oil, especially for thyroid problems. I’m excited to try your product. We are so happy that you are excited to try our product!